Microsoft is not releasing any new insider preview build this week. A new leaked information shows that insider team is working on Windows 10 Creators Update (Redstone 2) build 14980. 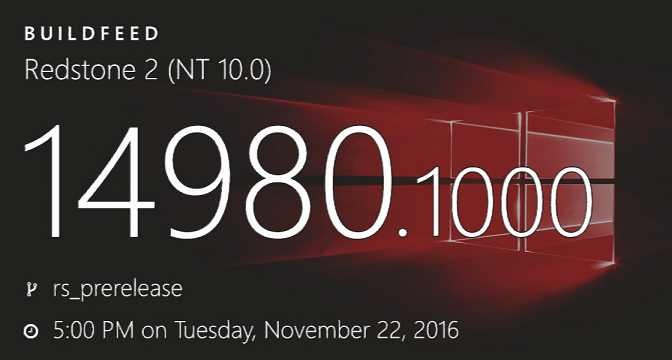 The new Windows 10 Build 14980 and mobile build 10.0.14980.1000 were compiled on November 22, 2016. The company is also testing cumulative update build 14393.571 for Windows 10 anniversary update users. Windows 10 Anniversary update cumulative update kb3200970 build 14393.447 for PC and mobile build 10.0.14393.448 is now available. The company also released cumulative update KB3198586 build 10586.679(Threshold 2) and update KB3198585 build 10240.17157(RTM) for users. Windows 10 build 14965 ISOs downloads are now available for insiders.